There are some extremely impressive, premium text to speech software tools (few) for the MS Windows platform that blow your mind ;-). Even the default one included in recent versions of Windows 7 is pretty decent (when compared to the older Microsoft ‘Sam’). Though may not be as good as some of those, but there are also few open source TTS software available for the GNU/Linux users as well. For instance, if you use Ubuntu, then you can use the ‘eSpeak engine’. It has few built in voices too but they’re not that high in quality. 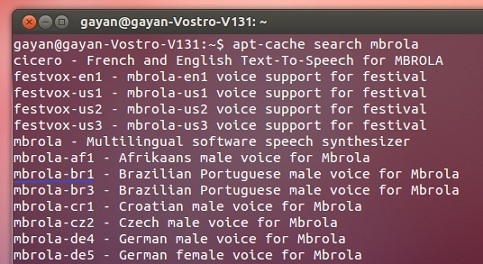 However, there’s another open source, highly quality voices called ‘Mbrola Voices’ which you can use with ‘eSpeak Speech Synthesizer’ and when comparing with the default ones, ‘Mbrola’ voices sound more human!. 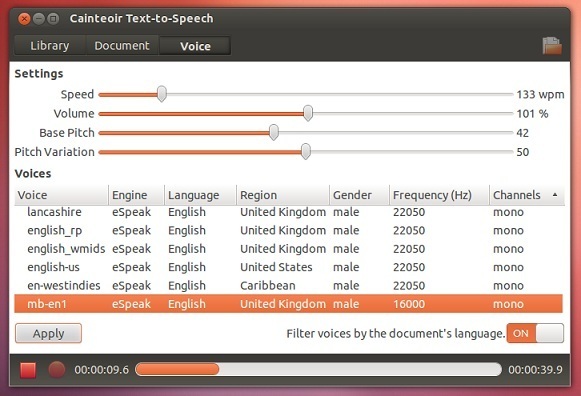 You can use the eSpeak GUI or Gespeaker for you TTS needs in Ubuntu. However, there’s also this other one called ‘Cainteoir’ that you can try. It’s basically a graphical front-end that uses ‘eSpeak’ for the text to speech conversion. It’s a new tool (relatively speaking) but unlike those two tools, it’s in active development, comes with a UI that seems to follow the Gnome Shell’s standards and looks simple and intuitive. So I decided to give it a go and ended up loving it! :D.
*. Convert various types of documents (HTML, plain text, PDF, ePub, XHTML, XML etc) into speeches. *. Record the text into an audio file (WAV and OGG Vorbis formats) so you can carry it around and play later (you can use the ‘Record’ button at the bottom of its window for that). *. Use the built in voices in ‘eSpeak’ or anything that ‘eSpeak’ supports (including those ‘Mbrola Voices’). *. Ability to detect the selected document’s language and change the voice engine accordingly. *. As said above, I love its UI over others, it’s easy to use, lets you open the ‘recent documents’ and lets you adjust various speech related settings with ease (volume levels, change between voices, supports any language included in ‘eSpeak’, change the speed, adjust base pitch etc). If interested, you can install ‘Cainteoir’ in Ubuntu 12.10Quantal Quetzal, 12.04 Precise Pangolin, 11.10 Oneiric Ocelot, 11.04 Natty Narwhal, 10.10 and 10.04 by using its PPA (thanks ‘Dunn’!). For that, as usual, open your Terminal and enter the below commands. Now simply search for ‘cainteoir’ in the ‘Dash’ and open it. If you click on the ‘Library’ tab, it’ll show you a history of your opened documents, and if you want to read one of them, then simply select it and click on the ‘Play’ button at the bottom toolbar. If you click on the ‘Document’ tab, then it’ll show some basic info about the currently playing/selected document (amount of words, the selected TTS Speech language etc). And whenever you want to adjust ‘Voices’ and their settings, click on the ‘Voice’ tab. As mentioned above, I prefer to use the ‘Mbrola Voices’ because they ‘sound’ better. But before installing these voices, close the ‘Cainteoir’ window. If you want the ‘American English’ male voice, then enter the below command in your Terminal. If you want the US Female voice, then enter the below one. ‘Mbrola’ has a lot of other voices for various other languages (UK, German, African etc), for getting a list of available packages to install, enter the below command in your Terminal window. Then once you find your preferred voice package’s name (located to the left), then simply copy the package name (a package name is marked in Blue in the below screenshot) and replace ‘mbrola-package-name’ part in the below command with it. After installing your preferred language, again open the ‘Cainteoir’ main window and click on the ‘Voices’ tab and find (scroll down/up if needed) the ‘Mbrola’ voice package’s name and select it then click on the ‘Apply’ button to make that Voice the default one. Whenever you adjust other settings (volume, pitch etc) then make to click on the ‘Apply’ button for applying those changes immediately. That’s all I have to say about that ;-). Good luck.